Eight-Man, Division I is the only poll that didn’t see some kind of changes this week. Here’s a look at the Kpreps Rankings for Week 7. Changes in the Class 6A poll occurred at the bottom two spots as Manhattan scored with a little more than two minutes remaining to top rival Junction City, 27-22. The Indians move up to No. 4 this week, while Junction City falls barely out of the poll. The Blue Jays are replaced in the No. 5 spot by the undefeated Garden City Buffaloes. Garden City fell behind 27-0 at home to Wichita Northwest before rallying for a 46-34 win. Derby, Blue Valley, and Shawnee Mission East continue to hold down the top three spots in the 6A poll. Wichita Heights remains in the top spot in Class 5A this week narrowly ahead of No. 2 St. Thomas Aquinas. The Falcons edged Kapaun Mount Carmel 24-21 on Thursday night to stay unbeaten, while Aquinas beat St. James Academy 24-7. Great Bend remains ranked third after the Panthers won in Wichita against a City League school for the third time this season. Bishop Carroll moves up a spot to No. 4 this week with a 36-20 win over Wichita South, and Goddard enters the poll after beating Arkansas City, 52-13. The Lions take on undefeated Valley Center this week. Defending 5A champion Mill Valley fell out of this week’s poll after a 64-21 loss to Bishop Miege. Speaking of Bishop Miege, the Stags remain the unanimous No. 1 team in Class 4A-I after that win over Mill Valley. Miege led the Jaguars 64-7 at one point in the third quarter. Andale remains at No. 2 this week but the Indians needed to rally to top Wichita Collegiate 32-21. Andale didn’t lead in this game until the final minute when quarterback Taylor Richter scored from 17 yards out to put the Indians up 25-21. An Andale pick-6 on the next possession sealed the victory. Basehor-Linwood jumps up to No. 3 this week after a solid 45-9 win over Lansing, while Buhler re-enters the poll by beating Augusta 35-21. Maize South remains at No. 5 this week after the Mavericks shut out Winfield, 44-0. Louisburg, ranked third last week, drops out of the poll after a 28-27 loss to Spring Hill. The top three teams in the 4A-II poll remain the same this week. Holcomb and Frontenac remain No. 1 and No. 2, respectively, as both rolled to victories on Friday night. Columbus remains ranked third, but the Titans had to score 16 points in the final six minutes to overtake Galena, 36-35. Santa Fe Trail moves up to No. 4 this week after a 39-6 win over Prairie View. The Chargers have big district challenge when they host Topeka Hayden this week. Wichita Collegiate remains in the poll at No. 5 this week despite their 32-21 loss to 4A-I No. 2 Andale. The Spartans controlled the game against Andale until late in the fourth quarter and are the only team to slow Andale’s potent rushing attack. We have a new No. 1 in Class 3A for the second consecutive week. 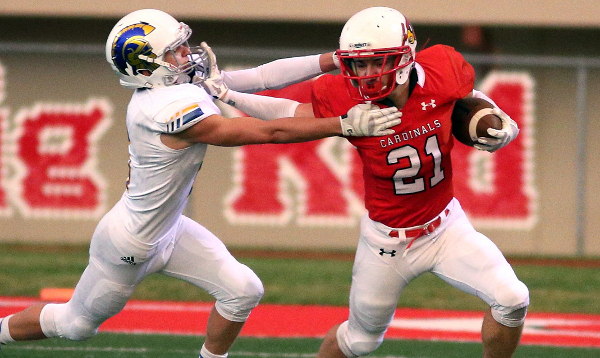 Our voters pushed the Hoisington Cardinals to the top spot after their 64-8 win over a solid Nickerson team. Hoisington narrowly edges out Silver Lake for the top spot. The Eagles struggled but topped Riley County 27-14 last week. Phillipsburg moves up to No. 3 this week after a 50-0 shutout of Larned. The Panthers move just ahead of Rossville though the Bulldawgs rolled past Burlington, 56-7. Garden Plain remains at No. 5 in the poll with a 59-14 win over Douglass. The Owls have their annual showdown with rival Conway Springs this week. Troy and Plainville remain in the top two spots in Class 2-1A this week. Troy blasted McLouth 51-6 and will entertain No. 5 Washington County for the Twin Valley League title this week. The Tigers slipped past Centralia 28-21 last Friday. Plainville shut out Sacred Heart 41-0 and travels to Oakley this week. Some change occurs in the other two spots as Smith Center moves up to No. 3 and Lyndon drops a spot to No. 4. The Redmen shut out Ellis 52-0, while Lyndon beat Osage City, 28-13. There are no changes in the 8-Man, Division I poll this week. Top-ranked St. Francis blasted previously-unbeaten Atwood-Rawlins County 52-6, while No. 2 Spearville beat Ness City by that same score. Burlingame, ranked third, ran away from previously-unbeaten Clifton-Clyde 66-20. Osborne won the battle of unbeatens with Logan-Palco, 84-44 behind big rushing nights from Cullen Grabast and Damon Schurr. Finally, No. 5 Central Plains had little trouble beating Little River, 52-6. It took six weeks, but Hanover finally allowed its first points of the season. The top-ranked Wildcats cruised to a 58-8 victory over Blue Valley Randolph on Friday, but the Rams were the first Hanover opponent to score this season. Hanover will take on Twin Valley League rival Frankfort this week in district play. Hodgeman County remains at No. 2 this week after a big win over Triplains-Brewster. The Longhorns are now in the meat of their challenging district schedule beginning this week when then host Sharon Springs-Wallace County. Pike Valley delivered a strong 58=8 win over previously-unbeaten Mankato-Rock Hills. The Panthers, ranked third, play 1-win Tescott this week before a showdown with Beloit St. John’s-Tipton in Week 8. Dighton bursts into the top five with a 42-32 victory over last week’s No. 4 Wallace County. The Hornets are unbeaten, but will have a difficult test this week against an Otis-Bison team that continues to get healthy. Finally, high-scoring Caldwell remains at No. 5 this week. The Blue Jays cruised to a 52-6 victory over Norwich, and awaits perhaps their biggest test of the season when they travel to talented Hartford this week. Hartford put up an impressive 94-60 district victory over Hutchinson Central Christian last week.